1879 Four-Dollar Gold Stella. Flowing Hair. Judd-1635, Pollock-1833. Rarity-3. Gold. Reeded Edge. Proof-65 Ultra Cameo (NGC). Obv: The Flowing Hair design by Charles E. Barber. Head of Liberty with flowing hair faces left with the date 1879 below. Liberty is wearing a coronet inscribed LIBERTY, and the inscription * 6 * G * .3 * S * .7 * C * 7 * G * R * A * M * S * encircles the border. Rev: A five-pointed star, or Stella, is inscribed with the denominations ONE STELLA and 400 CENTS. The Latin mottoes E PLURIBUS UNUM and DEO EST GLORIA are above and below the star, respectively. The legend UNITED STATES OF AMERICA is inscribed along the upper border, and another expression of the denomination FOUR DOL. is inscribed along the lower border. This is an awe-inspiring Gem to represent a classic rarity among U.S. Mint gold coin types. Sharply detailed with a softly frosted finish, the devices contrast markedly with deep pools of reflectivity in the fields. The entire package is dressed in vivid golden-yellow patina, the surfaces carefully preserved to readily uphold the validity of the coveted Gem rating from NGC. The story of the rare and historic four-dollar gold Stellas of 1879 and 1880 begins with the desire in certain government circles to create an international coinage system that would be readily recognized and accepted throughout the world. Although it had surfaced earlier, this idea gained its greatest momentum in 1879 through the efforts of John A. Kasson, the United States' minister plenipotentiary to the Austro-Hungarian Empire and a former chairman of the Congressional Committee on Coinage, Weights and Measures. Kasson urged the federal government to consider creation of a four-dollar gold coin as the basis for a new international monetary system. Why a four-gold gold coin, one might ask, especially considering the widely accepted five-dollar half eagles and twenty-dollar double eagles already in international use? In Kasson's opinion, a four-dollar gold coin struck in the United States Mint would more closely approximate in value the widely used and accepted gold coins of several European countries, including Austria's 8 florins, the Dutch 8 florins, France's 20 francs, Italy's 20 lire and Spain's 20 pesetas. Throwing his weight behind Kasson's proposal, serving chairman of the Committee on Coinage, Weights and Measures, Alexander H. Stephens, wrote to Secretary of the Treasury John Sherman requesting that the Mint prepare pattern four-dollar gold pieces for evaluation by Congress. The Mint eventually prepared two different proposed designs, a flowing hair motif by Charles E. Barber and a coiled hair design by George T. Morgan. The Barber Flowing Hair type was used to prepare only 25 (and possibly as few as 15) examples for distribution to Congressional leaders. Those coins are dated 1879 and, per traditional numismatic wisdom, were struck in a metric alloy of 85.71% gold, 4.29% silver and 10.00% copper. 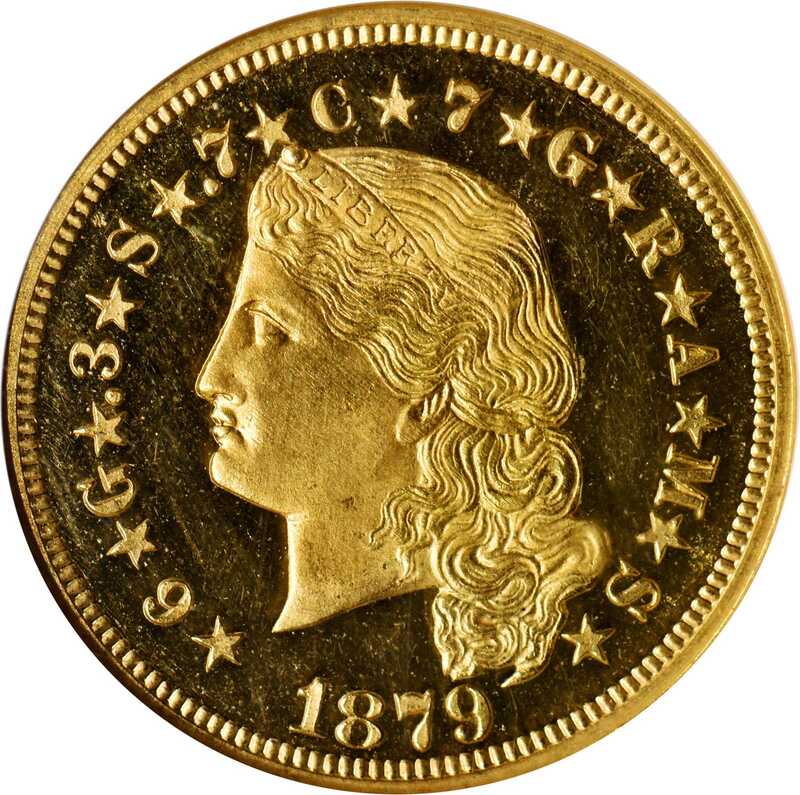 Demand among Congressional and other government officials for examples of the proposed four-dollar gold Stella proved so great, however, that the Mint eventually prepared perhaps as many as 700 additional specimens in early 1880, still using the 1879-dated Flowing Hair dies. These pieces are struck in standard alloy of 90.00% gold, 10.00% copper on shaved half eagle planchets (per the website us.patterns.com) and, as with their predecessors produced in 1879, were used for presentation and other official purposes as well as for numismatists. Despite its popularity with Congressional leaders and other contemporary politicians, in the end the four-dollar gold Stella failed to gain authorization for regular issue production and the project ended. As a "type coin," the 1879 Flowing Hair Stella is a significant numismatic rarity, even more so from a market availability standpoint given the strong demand among advanced collectors. For although technically a pattern (as the four-dollar gold denomination was never authorized for regular issue production), the Stella has long been collected as an integral part of a complete type set of classic United States Mint gold coinage. Its popularity is such that the denomination has been ranked 28th in the 2003 edition of the influential book 100 Greatest U.S. Coins by Jeff Garrett and Ron Guth. NGC Census: 5; 8 finer in this category (Proof-68 Ultra Cameo finest). PCGS# 98057. NGC ID: 28AZ.